Why Missoula Needs A Fire And Water Restoration Company Like Ours! Here at HiCrest Restoration & Clean, Missoula’s commercial and home restoration company of choice, we say we can help “make your house home again” with our range of restoration services. We work to restore your home to its original, pre-damaged condition as efficiently as we can. That efficiency requires a dedication to balancing two factors. The first is swiftness. No matter if we are discussing water damage cleanup, mould removal and mold cleanup, sewage cleanup, fire damage cleanup, ore even carpet cleaning services as part of our water damage remediation services, we are committed to having a capable team that can execute a plan quickly. It sometimes can be the case that the more swiftly we are able to provide home remediation services, the greater impact our work can have. The second factor is quality. Speed of work doesn’t mean a whole lot when you don’t know how to get the job done in the first place. That pithy “buy it nice or buy it twice” line your grandparents used to annoyingly apply to a multitude of scenarios rings true yet again in this instance. 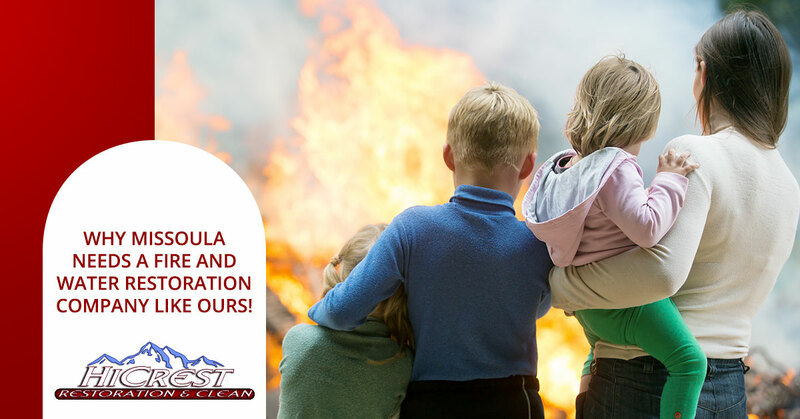 With our combination of advanced technology, proven methods, and an experienced staff give us the opportunity to provide the top disaster restoration services for Missoula homes and businesses that you will be able to find (in our humble opinion, at least). Today’s topic is water restoration services, along with when and why you should consider giving your local water damage company a call to let the professionals go to work. It can be a sometimes difficult decision, but giving us a ring at HiCrest Restoration & Clean to get more information and special deals for first-time visits won’t cost you anything. But in the meantime, keep reading if you are interested in learning why and when somebody needs a fire and water restoration company like the one we’ve got here at HiCrest Restoration & Clean! If there is a fire in your home or business, you will be extremely busy and stressed out during the fire and even after, sorry to say it, the smoke has cleared. You are in pure adrenaline-charged, emergency-mode. But after you have made sure everyone is safe and sound, what should you prioritize when it comes to fire damage restoration and smoke damage cleanup? After you have contacted your insurance provider to inform them of the fire, you can ask them for any referrals for fire restoration contractors in Missoula. If they know what’s good for them, they’ll recommend HiCrest Restoration & Clean, not that we are biased or anything. People come to us from referrals, but they can also reach us by typing into their smartphones something like “fire restoration contractor near me” or something as simple as “local fire restoration”. Whichever way you find us (or, heaven forbid, a different smoke damage restoration contractor of Missoula), the point is that you need to do it as quickly as possible. Getting an insured and licensed fire restoration company on your side will make sure you diminish the risk of any further damage to your home. At HiCrest Restoration & Clean, for example, we will do our best to save any salvageable appliances, clothing, furniture, and personal belongings within our power. We will carefully note our work by documenting and photographing our progress so that you can keep such information for your personal records. And throughout the process we will make sure we keep you as informed as possible. We make a point to keep you in the loop so that you can help guide us if any key decisions need to be made. Having your home burned and damage can lead to the feeling of powerlessness and helplessness. Going with a fire damage cleanup company like HiCrest Restoration & Clean can help restore some of that control by helping you understand the situation, so you can determine what is best for you, your family, and property. We’ve established the fact that you need to get in touch with the professionals as soon as possible. But is there something you can do in the meantime to prevent additional damage? Perhaps yes, but if and only if there is safe access to your home. If you are able to safely enter your home, make sure you are properly equipped with respiratory protection, long sleeves and pants, and work gloves. Clean – We repeat, only enter the affected premises if you are certain the area is safe. If you are able to do this, feel free to scrub all affected surfaces down with soap and water. If you’ve got it, use an alkaline cleaner to do the job. This has a neutralizing effect on the soot’s acid, which reduces the smokey smell. We do not recommend using the more advanced chemical cleaning agents – leave that to us. Laundry – Machine wash all clothing and bedding with an alkaline cleaner. Don’t be alarmed if you end up having to wash them more than once, either; it’s part of the process. Oh, and make sure you do not use the washer and dryer affected by the fire. Ventilation – Set up some house fans and open the windows to air out the house as best you can. We provide industrial-strength fans, but in the downtime, before we arrive, feel free to start the process of getting the polluted air out. Whether you are staring at commercial fire damage or smoke damage restoration services for the home, we’ve got you covered at HiCrest Restoration & Clean! Hiring a Missoula water damage company is a good idea for many of the same reasons that you should hire a fire restoration contractor. The more quickly we can expedite the water damage cleanup, the more damage prevention we can likely effect. A local water damage contractor like HiCrest Restoration & Clean will first survey the property to gain an understanding as to the extent of the damage. Once that is accomplished, we will remove pooled wetness and moisture where possible. Burst pipes are often the culprits for any remaining standing water, so commercial extractors must be used to take care of that kind of issue. Did you know that carpeting can lose 50 percent of its integrity if it’s exposed to standing water for just 24 hours? Likewise, wood floors can become warped if moisture is left undealt with. Utilizing our commercial-grade, high-speed air movers, heat injectors, and dehumidifiers, we are more than capable of efficiently drying out the flooded areas of your home or business. We work hard to make sure the affected area is odor-free, looks and feels like home, and, of course, is safe to go back to. With our rapid, professional, and compassionate response team, we provide folks of Missoula and beyond with quality work and guaranteed work on your home! With honest estimates and prices, we want our first-time customers to become lifelong clients, should we ever be needed. Our goal is to make your house your home again. If possible, we want it to look even better than it once did. We do this by treating your home as if it was our own. Get in touch with us if you are in need of Missoula fire or water damage cleanup services!